Behold the most fabulous voyage of the moment! Hop onto any of your mobile or desktop devices to visit the awesome slot game of Vegas Nights Slot. This five-reel slot game brings you closer than ever to the glam and glitz of Vegas, the land of casinos. Who would want to miss that? Well, you can bathe in the ambience of the fantabulous slot as you will. After all, Vegas Nights Slot is the game where all the marvels of the nocturnal life of Vegas are enclosed! To play Vegas Nights Slot, you will need to log into your account or register for one at Wicked Jackpots. This slot game by Pragmatic Play promises to offer you a dazzling gameplay. Thanks to the phenomenal symbols like Cabaret Dancer, Car, Cards, Dices, Roulette and high ranking card symbols, A, K, Q and J. Bet Levels: No Bet Levels, sorry! But worry not! You can select the number of coins that you are going to play per round. You are allowed to choose from one to ten coins per round on Vegas Nights Slot. 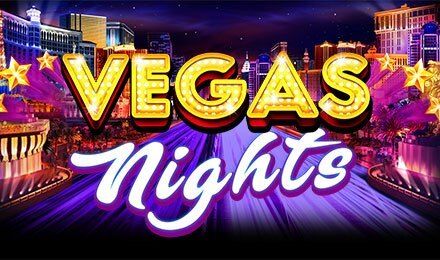 Amount of Paylines Selection: Vegas Nights Slot offers 25 fixed pay lines. Coin Values: You can choose to change your current stakes at any moment except during Free Spins Features. Coin values range from a minimum of 0.01 up to a maximum of 0.50. Anyone for Wilds? The Spade Chip Symbol stands for the Wild Symbol of Vegas Nights. If it appears on the reels, it will chip in the combination as any other symbol of the game. However, Wilds cannot substitute for Scatters and Super Wilds Symbols. Wilds appear on all reels except for reel 1. Super Wilds are always a treat on Vegas Nights Slot. Appearing only on reel 5, it comes as a diamond-studded chip symbol. It acts as a standard wild symbol. However, if it appears on the middle row of the fifth reel, it activates the Extra Wilds ReSpin Feature. Obtain the Super Wilds Symbol on the middle row 5th reel to activate the feature. You will be granted three Re-Spins. All Super Wilds, Scatters, A, K, Q and J symbols on the reels will change into Wilds. Welcome To Vegas. No, it’s not a greeting but a symbol on Vegas Nights Slot. This Symbol stands for the Scatter Symbol of the game and helps in the activation of the Free Spins Feature. If you manage to land three Scatters, you’ll activate the Feature. You are initially rewarded with 5 Free Spins. During the feature, all wilds and Super Wilds carry a 2x or 3x multiplier. If they are included in a winning combination, the pay outs are in effect of the multiplier. You can activate the Extra Wilds Re-Spin Feature during the Free Spins Feature as well. However, Wilds created through this feature will not receive Multipliers. Additional three Scatter symbols will re-trigger the Feature. There are no limitations to the number of times you can reactivate the feature. Ready for a voyage to Las Vegas? Good luck, player!